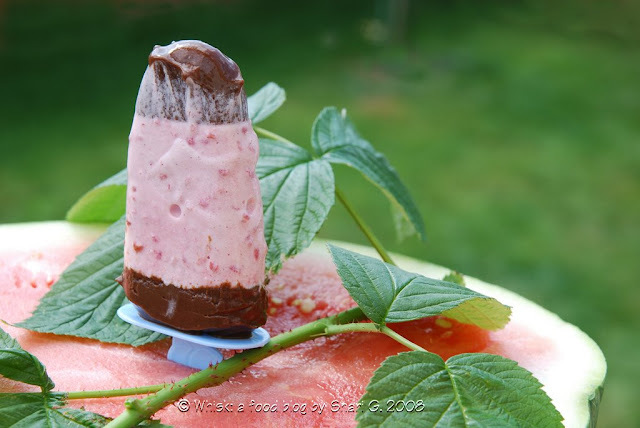 And thank you Oprah for including my adaptation of one of Dorie’s recipes on the Oprah website that I morphed into popsicles: Chocolate-Banded Ice Cream Torte. Chocolate and raspberries are a classic, indulgent and tasty combination. In this recipe, Dorie freezes them together in a delicious ice cream cake that appeals to the over 10 set! The chocolate part of the dessert is basically an unbaked flourless chocolate cake: chocolate, butter, sugar, and eggs. Although it’s called a ganache in the cookbook, technically a ganache is just cream and chocolate (no eggs or butter). As for the chocolate, I used Bernard Callebaut, who is internationally recognized for producing the best chocolate in Canada and throughout the world. When I was in Saskatchewan, I was able to pick up some Callebaut chocolate at one of his locations. After returning to Ottawa, I found out that my favorite local chocolatier, Truffle Treasures, uses Callebaut chocolate in her truffles, and I can buy Callebaut at her store too. The ice cream step is easy. Using my food processor, I puréed raspberries and added my favorite vanilla ice cream. Then, I threw in a splash of framboise. 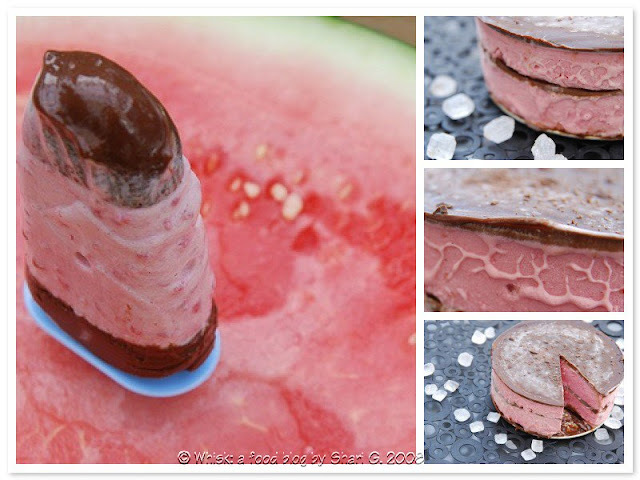 I tried freezing this dessert in popsicle molds, but I think it would be better to dip them in the chocolate after freezing the ice cream in the molds so that you have a bite of chocolate with each bite of raspberry ice cream. You can find the recipe for Chocolate-Banded Ice Cream Torte in the book Baking: From My Home to Yours by Dorie Greenspan. Yield: This recipe made 10 popsicles and one 7-inch springform pan. The reviews on this one were mixed from the under 10 set: one daughter liked the chocolate but not the raspberry ice cream, another liked the raspberry ice cream but not the chocolate, and the third liked both together. The adult set thought it was delicious! To see all the treats I baked for Tuesdays with Dorie, click here. You should really buy Dorie’s cookbook Baking: From My Home to Yours. There are so many wonderful recipes between its covers. What a fun post! I love seeing your creative variations on Dorie's recipes and your Top 15 list. I'll have to make another top list for TWD soon, it's been a long time. The article in O was fun to be a part of and to read. Congrats on your mentions! I think it's wonderfully creative to take a recipe and look at it in a totally different way. I'm going to try this! this is so cute, Shari! you are so creative. This is so nice. Can't wait to get my Oprah magazine. Congratulations! Congrats on your mention and recipe feature! I had somehow missed this the first time around. The article in O mag. was so fun to be a part of and so fun to read too. I love your blog! This is my first time here and I really like the way it is layed out. The photos make my mouth water. I am going to make the yogurt coffee cake!